Oh! the hats are so adorable on the oh so sweet dolls!! I can't wait to purchase the patterns but, we have had a few set backs so it will be a few weeks :) Hubby had his appendix rupture so was out of work for a week with no pay but, we are just happy that he is OK. 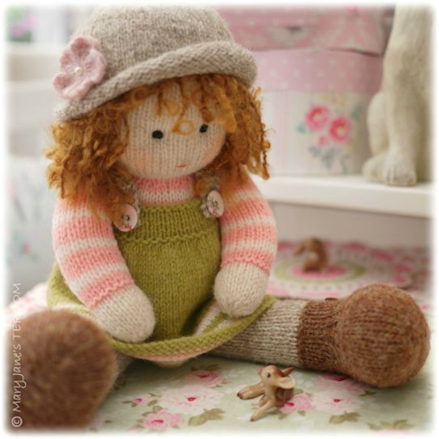 I am so looking forward to knitting one of these cuties and the hats are just too adorable!!! É apaixonante ver o seu trabalho. Parabéns. 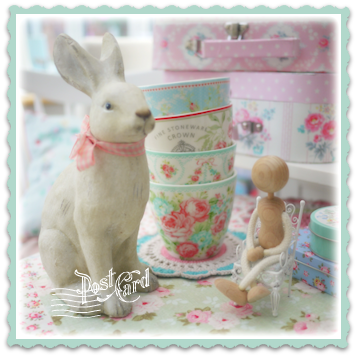 You are so clever to create these beautiful dolls and accessories for them! Oh, the dolls and the hats are so cute! Oh Susan! 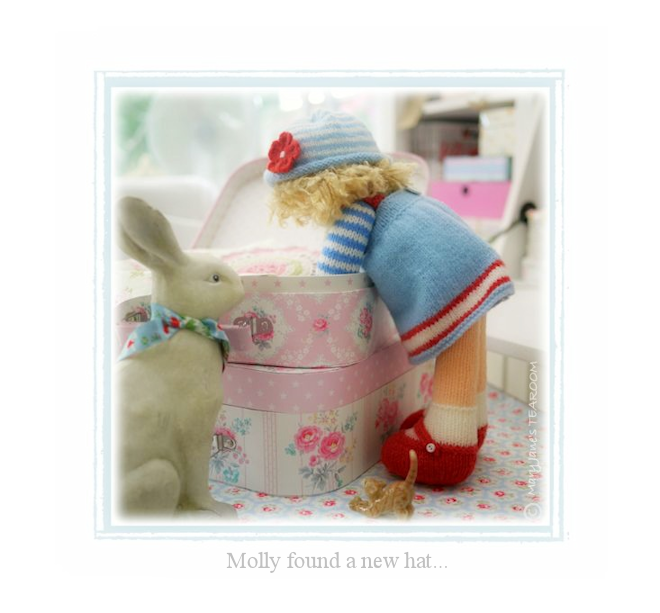 Oh How I just love the picture of Molly finding her new hat! The sweetest ever!!! I have always admired your work for a few years now that I have taught myself how to knit!!! 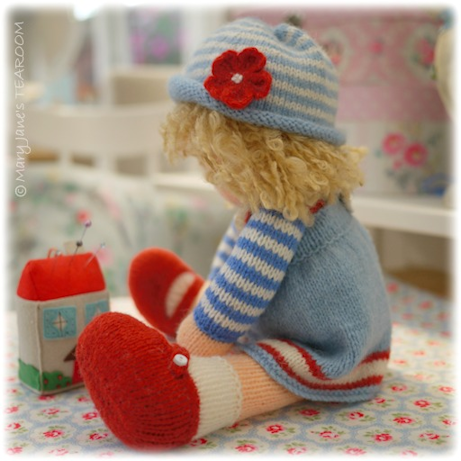 I might have to buy some of your patterns now and give them a go! SUSAN! I HAVE MISSED YOU! Molly guapísima con su nuevo sombrero y guapísima sin él. Molly es preciosa. So pretty - you are so very clever - I wish that I could knit. The dolls are gorgeous....and the hats just make them even cuter. beautiful dolls and the hats are just perfect. I love your page. To look on it is like heart - balm. The affectionately arranged scenes the colors and last but not least your enchanting dolls and animals, these all are so lovely. Oh your blog is so magical dearest Susan! I have missed your posts! So much prettiness, gorgeous dolls. 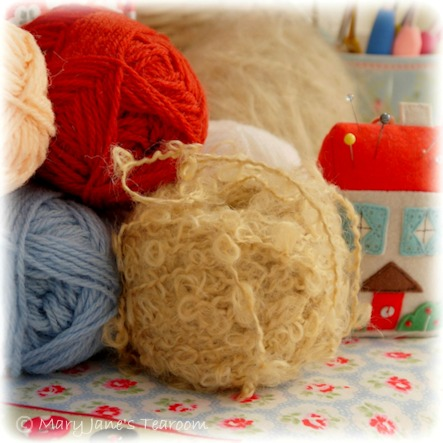 :-) What a gorgeous post! It made me smile!!! I love how you've set the photos of the little dollies up! We are slowly emerging from our holiday fuzz, having returned homelate on Sunday evening. Although I am always glad to return home my heart is aching a teeny bit at having left my parents, siblings, nièces and nephews who are lingering a couple more days on the island of Belle Ile en Mer where we spent ten fabulous days. Suffice to say this post of yours with your GORGEOUS dolls is just the sight I need to make me sparkle Inside! I love your dolls so, so much and that picture of Molly finding a hat in the suitcases is perfect. Good luck with the busy side of life dear friend. the hats are so cute. Wish you a nice week and greetings favorite. 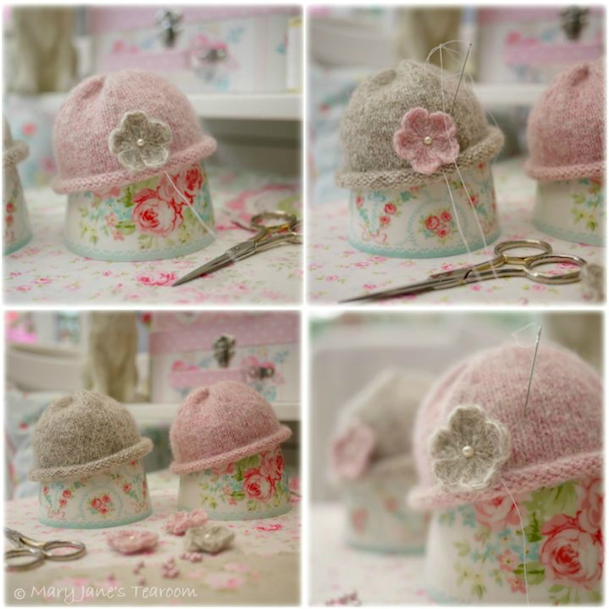 So lovely to see your latest post - and am looking forward to the little hats pattern! I made dolls as planned for my grand-daughter and all her little friends as planned for her birthday party - and they were all loved very much!! 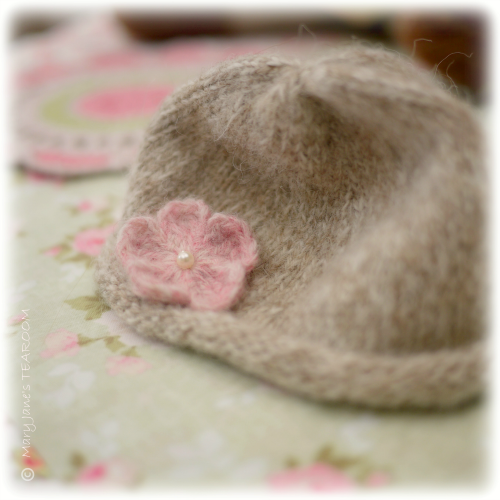 Beautiful photos and the hats are so cute........adding the wee flower is such a lovely idea! A lovely addition to a great pattern, I look forward to it being released. Ιt's like a fairy tale, so beautiful all the shades you chose. Very pretty indeed! Your blog and your art are like heavenly visions, Susan. I am so happy that technology allows us to visit this way. So inspired by all this beauty. Rather belatedly, can I just say that these hats are too cute! I so admire your work Susan. I love the doll, I love the hat, I love everything!!!! I absolutely love the new dolls and her hat. I haven't been here for a while ( not sure why but sometimes I don't get your updates), but every time I come back you have even more beautiful things to show. Lovely, lovely.